A solid foundation for all duty gear essentials on a rig starts with the Bianchi AccuMold® Elite™ 7980 Duty Belt with a Tri-Release™ Buckle. Bianchi constructs this belt as a four-part laminate, including an exterior crafted from Duraskin™--a tough synthetic with a professional leather-like look. The 2.25-inch wide duty belt withstands wear and tear from daily use and prevents sagging thanks to the Tri-Release™ polymer buckle. 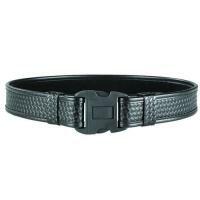 The durable buckle resists breakage and employs three points of contact to release its hold for guaranteed security. The belt's interior looped lining interfaces with Bianchi's® 7205 Liner Belt with hooked panels. Your entire duty rig can be completed with accessories and pouches from the AccuMold® Elite™ series. Belt is awesome. Buckle seems flimsy, curious to see if it holds up.